Can you spot what’s wrong with this image? Unless…did Eazy invent time travel? 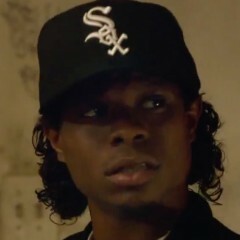 The cultural cachet of the modern Chicago White Sox hat can’t be understated, given its ties to the legends of West Coast Hip-Hop, such as Eazy-E, who was depicted wearing the black and white “Sox” with Old English script all throughout the hit film Straight Outta Compton. Problem is, the producers and director F. Gary Gray should have chilled on all that until about the time Ice Cube broke wild and aired out the crew. Unfortunate…yes, but not that big a deal. Chairman Reinsdorf is still getting his regardless and in the end even if the point was made clumsily, the film still made an effort to tie in the connection our humble South Side team has with some of modern music’s most important trailblazers.